The abbreviation DPO stands for Days Post Ovulation and sometimes referred to as days after ovulation. Every month one of your ovaries releases an egg at around 14th day of the cycle. Once you figure out your ovulation date and your fertility window, then you can start referring time as 8 DPO and 10 DPO. Eventually while trying to get pregnant, you’ll be pretty used to such terms like ten days post ovulation. This event is ovulation and days following it are days post ovulation. You can talk about pregnancy symptoms regarding DPO symptoms. The first pregnancy symptoms which change along with time are broadly referred as early pregnancy signs. When you talk about pregnancy symptoms by DPO, it becomes more specific and nonoverlapping. You notice significant changes in breasts and body as 8 DPO symptoms. The 10 DPO pregnancy symptoms tell you that it is time to take the pregnancy test. 10 DPO no symptoms could be because of late implantation or slower pick up of pregnancy hormones. Can you take a pregnancy test 10 DPO? Days Post Ovulation is a way of timing events after ovulation. Even if you are looking for pregnancy symptoms by DPO, ovulation is the reference. One can consider events from implantation, but it is not easily detected. Only 1/3rd of pregnant women have implantation bleeding. Cramping at that time is mild compared to menstrual cramps, and so it is possible that you may not feel it. When you ask your doctor about when can you take a pregnancy test, she may say 11 DPO or 10 DPO. It means that after a week and few days from ovulation you start experiencing pregnancy symptoms. Some women have pregnancy symptoms 10 DPO others may have it earlier as 8 DPO symptoms. Even if you are late and have 11 DPO no symptoms, you don’t need to worry. The 11 DPO pregnancy symptoms are puzzling because this is the time your PMS starts. Every woman may express and even feel different 10 DPO symptoms. But there is a list of 10 DPO pregnancy symptoms generally experienced by most of them. Whether 10 DPO symptoms BFP holds true for you or not depends on how rapidly your body produces hCG. The big fat positive pregnancy test line is only after your urine has enough hCG. Placenta forms hCG which is the hormone that pregnancy tests detect to give a BFP. While some women may get a 10 DPO BFP, others may take way longer than that. After a week from ovulation, the blastocyst or bunch of baby cells implant in uterus and hCG levels pick up. The early pregnancy tests can detect pregnancy five days before missed period which is 10 DPO. Due date of the period is around ten days after ovulation. Even if you are pregnant, you will have cramps, but you will not get period. During early pregnancy stages, you have mood swings and PMS symptoms but miss period. Some women have a period for the first three months of pregnancy and spotting during pregnancy. As the levels of progesterone pick up your breasts will have more blood flowing in them. Earliest pregnancy symptoms include tender breasts. A slight pain may persist in the region. The growth of breasts in size is significant during pregnancy, and so there is a pain. By this time if you are one of those who will have implantation bleeding, then it will occur. After a week of ovulation, implantation has to happen for successful conception. Implantation spotting is not heavy like a period and is brown. The cramping after implantation is not severe. The first trimester of pregnancy is miserable for most pregnant women because of morning sickness. Pregnancy toxicosis is what leads to morning sickness. After implantation, the chemicals produced inside your body can lead to nausea. Gas distress occurs because of increasing progesterone. The pregnancy hormone slows digestion and leads to constipation. Slow digestion leads to bloating and twisting of intestines. The cramps during early pregnancy are because of this bloating. Breasts feel heavy or full and become extremely sensitive. The increased blood flow to that region and hormone buildup is the reason for the sensitivity of breasts. If you are not pregnant then by the time you are near your period date, cervical mucus is thick. Pregnancy symptoms include the increase in the amount of cervical mucus. The cervical mucus at time of ovulation is like egg white clear and stringy. The quantity of cervical mucus increases when you conceive and this change occurs near 10 DPO. Most energy requiring developmental milestones of baby occur in the first trimester. Feeling lethargic and exhausted is normal and will stop after this stage of pregnancy. The change in hormones or increase in progesterone is one of the other reasons for fatigue. Nausea and vomiting also make you feel sick during this time. Cramps, gas distress, and bloating are causes of back pain. Avoid taking any painkillers because the pain will subside soon. You must take a healthy diet to avoid sudden weight gain. When there will be a gradual increase in fat, you will not have back pain in pregnancy. Nausea and morning sickness is synonymous with pregnancy symptoms. When someone has a lot of vomiting, loss of appetite during pregnancy is an inescapable outcome. The infamous pregnancy cravings are also related to the same cause. The well-known phrase two weeks wait implies the wait between ovulation and positive pregnancy test. Conception or fertilization occurs within 24 hours after ovulation. So ovulation and conception are two different references for the same time in a pregnant woman’s timeline. The sperms can live for about five days in your reproductive tract. The fertility period starts three days before ovulation. Yes, you can take a pregnancy test at any time after a week from ovulation and get a positive result. The chances of getting a 10 DPO no symptoms but BFP are rare. When you have 10 DPO no symptoms, then it indicates that your body is not producing enough hCG. The pregnancy tests detect a particular concentration of hCG in urine. A woman needs to have hCG levels of 25 mIU/mL to come in the pregnant category. Charting basal body temperature and guessing by looking for 10 DPO symptoms does not guarantee that you are pregnant. Sometimes you may have a late period and exaggerated PMS, so you can have similar symptoms even when not pregnant. You can take a pregnancy test after a week from ovulation. But the best time to take the pregnancy test is after a day of missed period. It ensures that the results you get will be at least 90% accurate. Most pregnancy tests claim that they are 99% accurate after a day of missed period. Cutting the chase looking for 10 DPO symptoms before BFP and take a pregnancy test sounds good but may lead to disappointment. The chances of getting a false negative pregnancy test at this time are high. So even if you take a pregnancy test 10 DPO, don’t worry if it is negative. Wait for few days and take another test. You may have 10 DPO negative test but symptoms which show that getting a positive test is likely to occur shortly. The main issue at this time is PMS timing, 10 DPO No PMS symptoms can be because of the late period. Late or missed period is not confirmatory for having a bun in the oven. Women taking birth control pills may even have bizarre things like 10 DPO symptoms disappeared. So, what one thought to be as pregnancy symptoms was a side effect of stopping pills. It is equally possible that if a woman doesn’t have PMS, she may get 10 DPO no symptoms BFP. A huge fraction of women have a lot of pain, cramps and mood swings during the period but some don’t have it at all. She may not even realize that she is having any such changes and be pregnant. Pseudocyesis or when the woman doesn’t come to know that she is pregnant until she is ready to deliver is a related event. The time ten days post ovulation is nothing when compared to the entire duration of pregnancy. You can have symptoms, or maybe it’s because you are creating them in your mind. Gas distress can be because you ate something that led to acidity. Vomiting and food poisoning are common and can happen. Taking contraceptive pills can delay your period such as in case of continuous birth control. You may have worked too much or lifestyle changes that is making you feel sleepy. And mood swings don’t need justification or cause and can occur any time. So if you don’t have 10 DPO early pregnancy symptoms, there is no reason to bother yourself. You can wait until two weeks after a missed period to get a positive pregnancy test. In fact not having such early symptoms is a sign of gradual development. When you have toxicosis at this early stage which leads to nausea it can be because your body is having a hard time. Commonly what happens is 10 DPO no symptoms because it is too early to experience any significant symptoms. The body needs time to undergo all the changes, and until the day of the missed period, it is early. 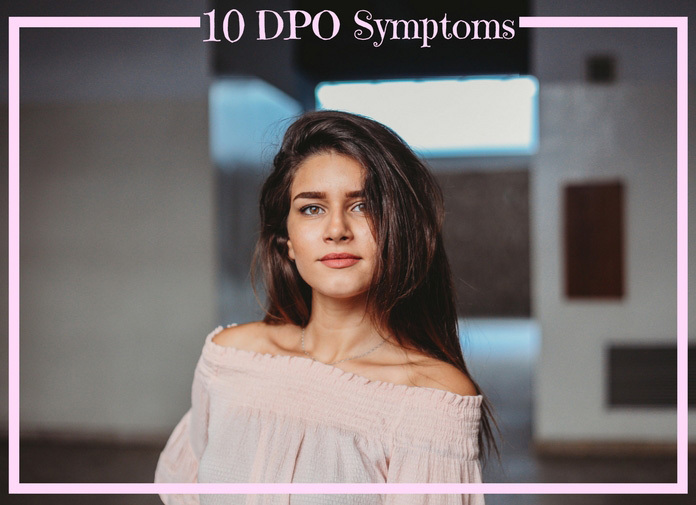 The 10 DPO early pregnancy symptoms are mild and can skip from coming to notice. I ovulated Saturday June 16th. We use the contraceptive film / inserts, however we didn’t wait the 10 minutes they recommend. Ever since, I’ve had really tender breasts, spotting for the next 5 days, a pinkis tone in the mucus. I took a pregnancy test last thursday, but it came back negative. I haven’t missed a period yet, AF is due in 2 days, but today i feel very tired, bloated, a queasy sensation in my lower abdomen / stomach and my breasts still are sore and experieince a litlle brown spotting. Should I be excited or it’s just my body getting ready for AF? It is really not possible to comment about the effectiveness of a contraceptive measure. U must take pregnancy test after missed period.